Hippie clothes. Bohemian clothing. Handmade in Nepal! 100% cotton patchwork no-match Hobo shoulder bag. This bag is decorated with lots of embroidery and other fun embellishments. Four inch gusset, zipper closure, stash pocket with velcro closure on strap which is great for storing keys!. The body of the bag measures 15" x 14" x 4" and the strap is 20" long from the top of the bag to the top of the strap, or 40 inches total.The bag is worn over the shoulder and falls about hip length on the average person. The back of the bag is plain. 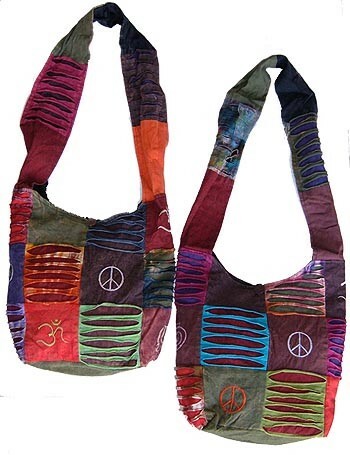 All bags have peace signs but the fabric swatches are different on each bag.A great addition to any bohemian hippie wardrobe. Check the measurements below.